iO Adria Limited today announced the affiliation of its Dubrovnik Sun Gardens property to The Registry Collection®. Situated on the coast near to the village of Orašac, Dubrovnik Sun Gardens is 20 minutes from Old Town Dubrovnik and just 45 minutes from Dubrovnik International Airport. Boasting one of the most comprehensive spas in the Adriatic, The Spa by OCCO is recognised as a world leading spa, having just won the prestigious Spa Traveller Awards for ‘Best International New Spa’ beating some of the top names in the business. The resort has its own private beach, 13 bars and restaurants, three pools and an extensive sports club. The resort also offers some of the largest and most flexible meeting spaces in Dubrovnik and Croatia with capacity for up to 900 delegates and is quickly becoming a destination resort of choice for meeting and conference organisers across Europe and North America. 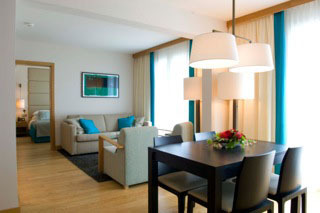 The resort complex includes a 201-room contemporary Radisson Blu hotel. The whole-ownership development, which has affiliated to The Registry Collection, comprises of 207 high-end one-, two- and three-bedroom residences offering both garden and breathtaking sea-views of the Adriatic, and the first 25 units have now been released for sale. Now in its third season of operation, Dubrovnik Sun Gardens is quickly becoming recognised as one of Croatia’s premier resorts and has just completed its most successful season of operation, outperforming the Dubrovnik five-star market. As such, the resort was recently recognised by Overseas Property Professional Magazine as Best Developer in Southern Europe. This is the first phase of a planned three-phase development which will see the addition of another five-star 130 key hotel and a further 200 Residential keys. Owners will be able to enjoy the benefits of affiliation to The Registry Collection, giving them the opportunity to stay at a choice of more than 180 luxury properties around the world.